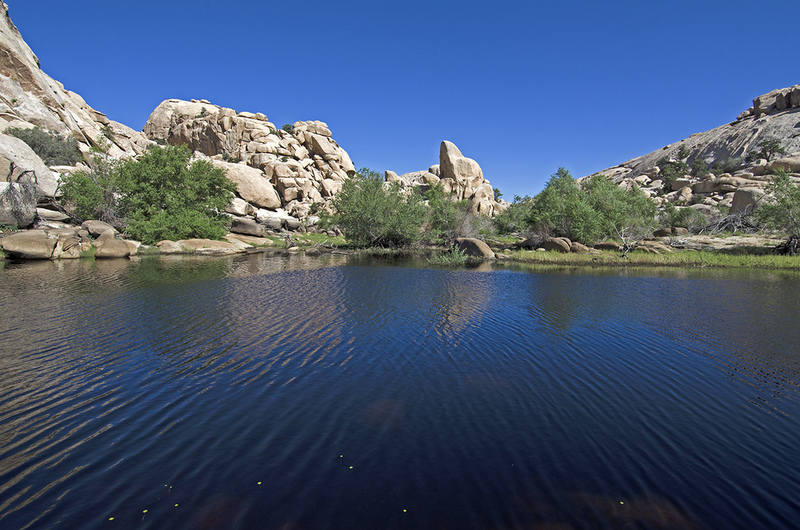 It had been over ten years since I last saw any water in Barker Dam, so when I heard reports that the recent monsoons had filled the dam up, I knew I wanted to get out and take a look. 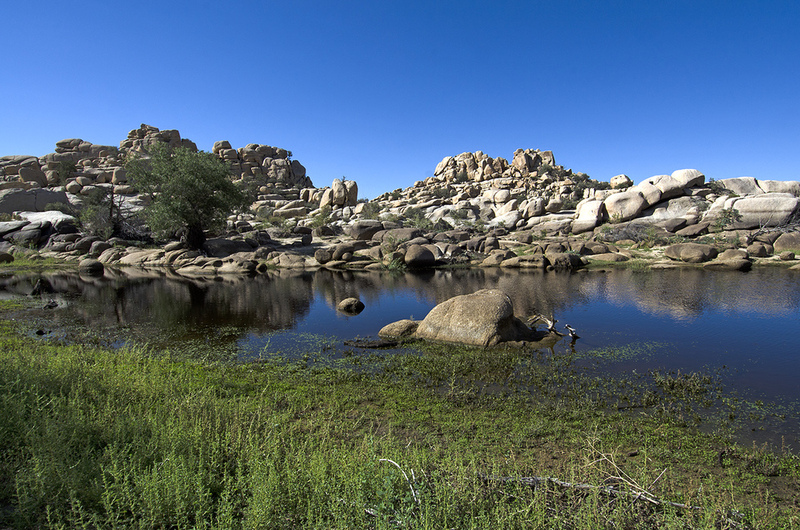 Then Murbachi emailed me some photos he took on 9/11/2013 and I knew the reports were true (be sure to visit his site for some great 3D images of the dam and surrounding trails. Click HERE to hop on over). Hoping there would still be enough water in the dam to provide some nice photos, and in spite of the weather forecast predicting temps in the mid-90s, I set out for the park. 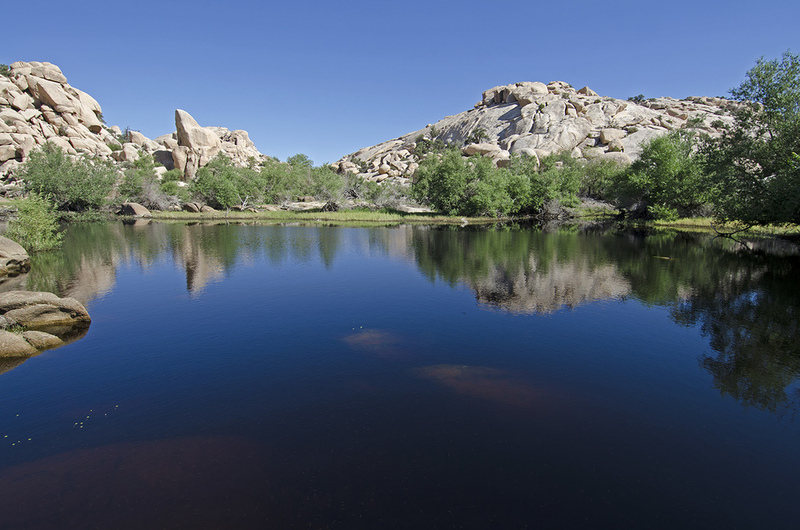 Even after hiking the Barker Dam Nature Trail dozens of times over the years, with family, friends, scouts or by myself, it’s still one of my favorite trails in the park. 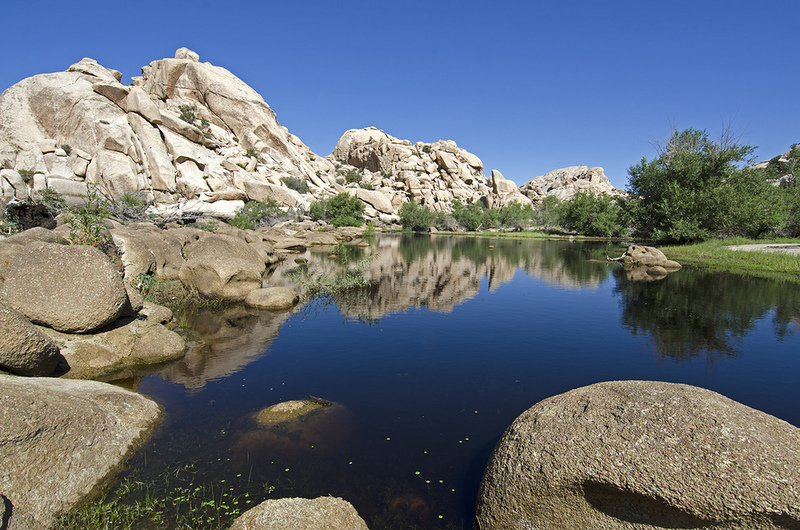 The loop is less than a mile and a half, but there is so much to see and explore along the way. 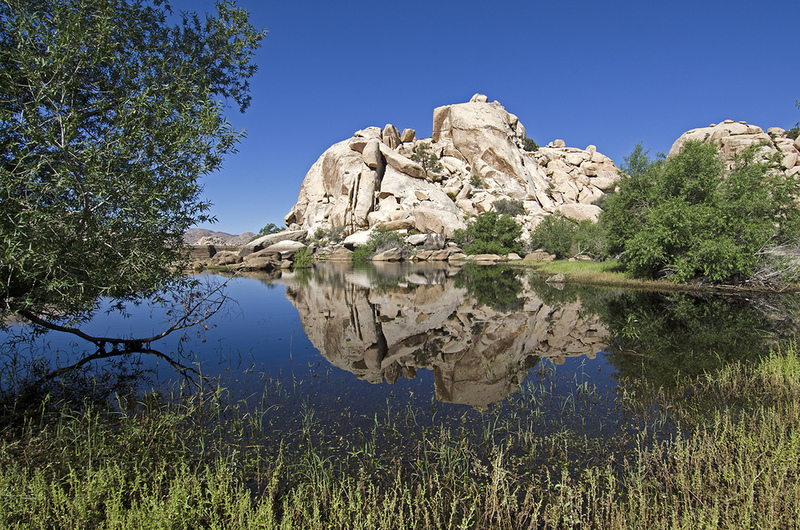 It’s a relatively easy and level hike, although nice boulders for rock scrambling are always nearby. 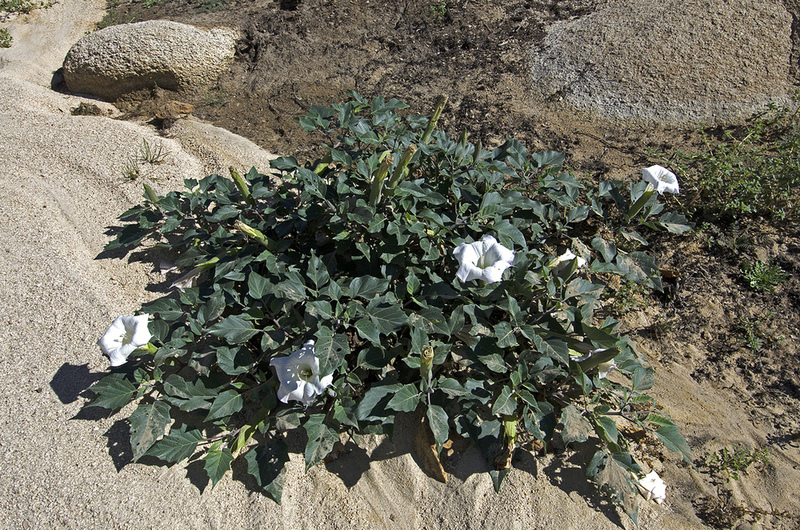 You can easily spend an entire day wandering this simple nature trail and the interesting places along the way. 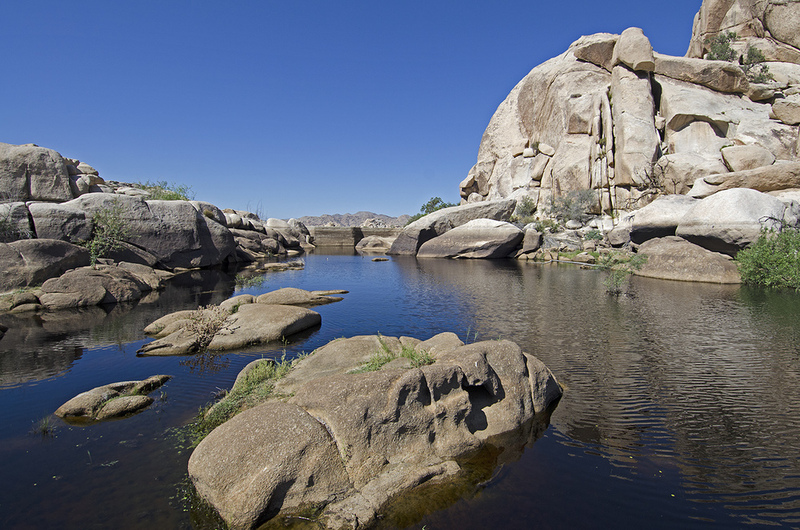 Barker Dam, sometimes referred to as the Big Horn Dam, was constructed in 1900 by early cattlemen who used Queen Valley to graze their stock. C.O. Barker was one of the men behind building the original nine-foot-tall dam. 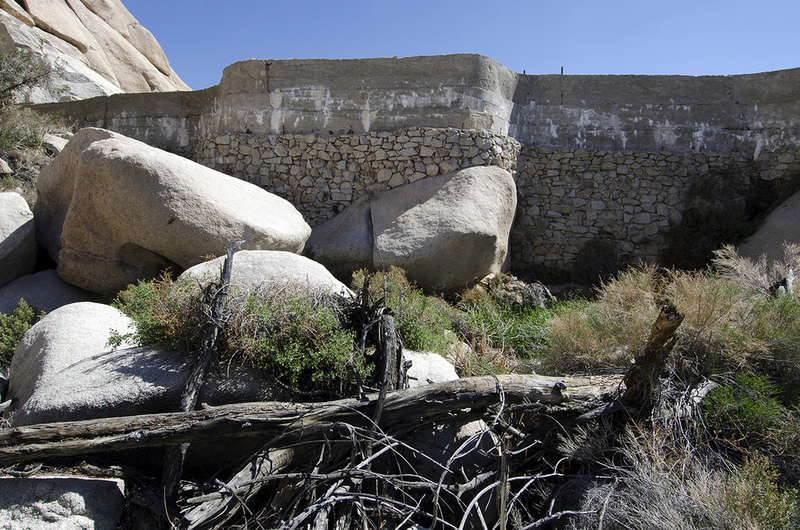 The dam was raised an additional six feet by rancher William Keys in 1949-50. 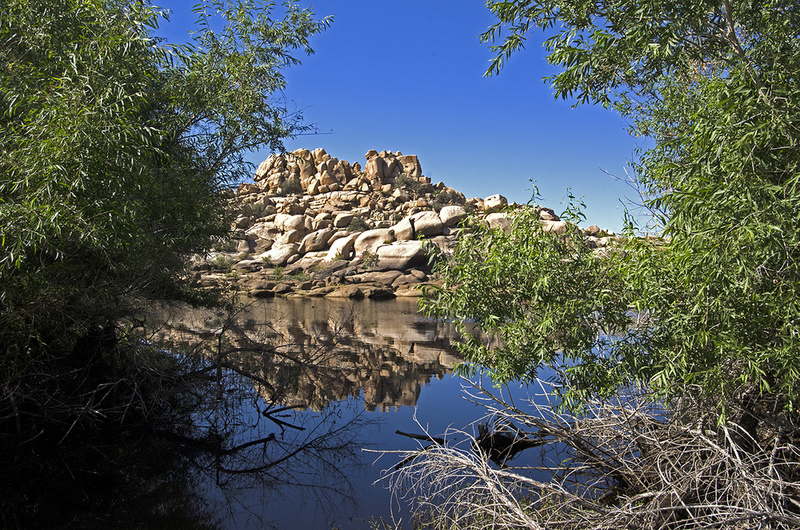 Constructed with concrete, stones and ingenuity, the dam is located at the western edge of the Wonderland of Rocks and when it holds water it really transforms the surrounding area. 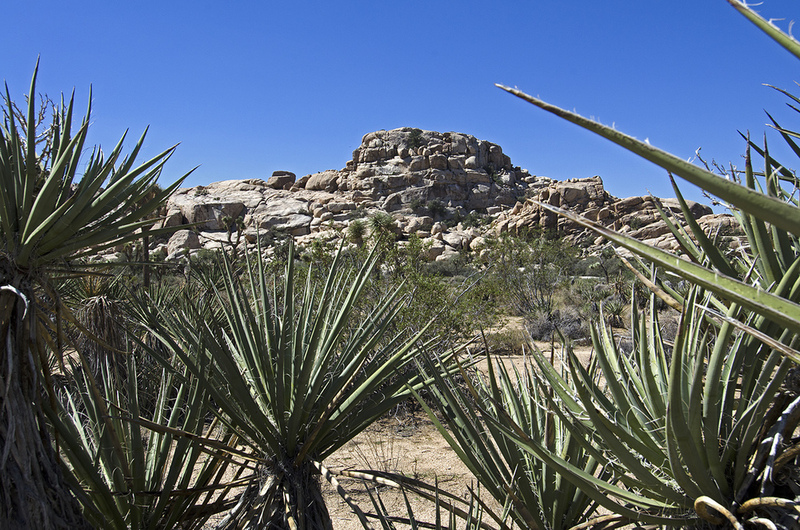 Everything turns green and it becomes a gathering place for many species of desert wildlife (one of the reasons no camping is allowed in this area). I got to the trailhead around 9:00 am (early for me), and there were only a few other cars in the lot. Within a few minutes I had my gear ready to go, and camera in hand, I set off. Then I returned to my truck to get some more water. Then set off again. 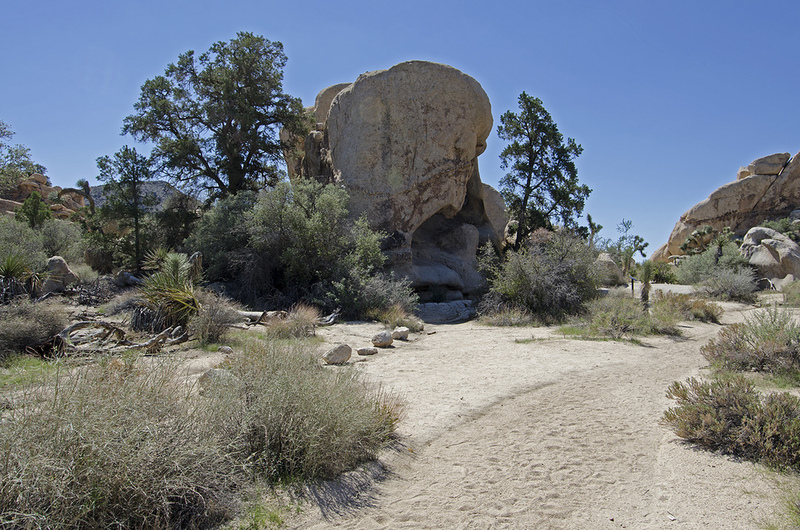 The first short section of trail leads across a sandy area toward some big granite boulders; wood rail fences mark the way. They’re only there to keep folks out of the protected area though, as there isn’t any need to mark most of this trail, it’s fairly easy to follow. Just past the wide sandy section of the trail, I entered the canyon I would be following for about the next .35-mile. 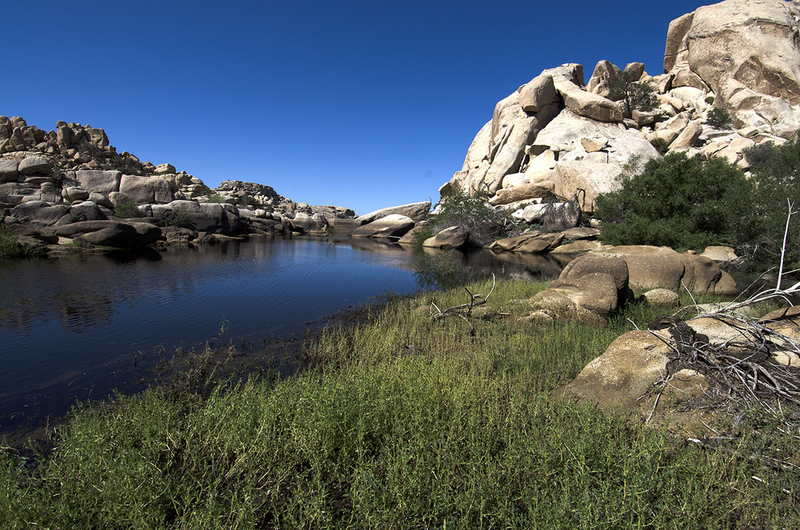 The trail narrows and the rocks on each side creep towards you, but they’re friendly and no cause for alarm. Just past this first “narrows,” the trail widens a little bit and I came to a fork in the trail. I took the north fork as I was excited to get to the dam; the west fork also leads to the dam, but it’s the slightly longer portion of the loop trail. There are some great rock formations through the canyon and some very picturesque dead trees along the way. 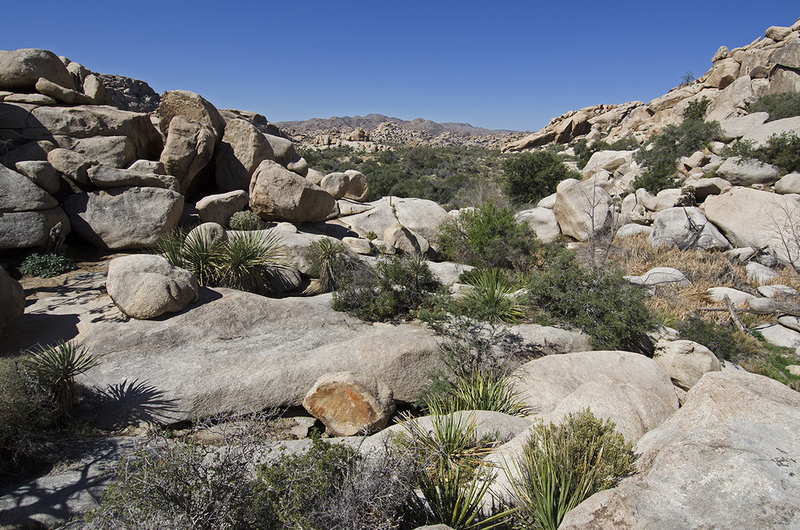 Several “mini-canyons” attempted to lure me off the trail with their wild granite beauty, but I resisted their siren call and stayed the course damwards. A couple portions of the trail lead through narrow gaps in-between large rocks; I can never decide if the apparent steps that help you through have been placed there on purpose or are natural occurrences. 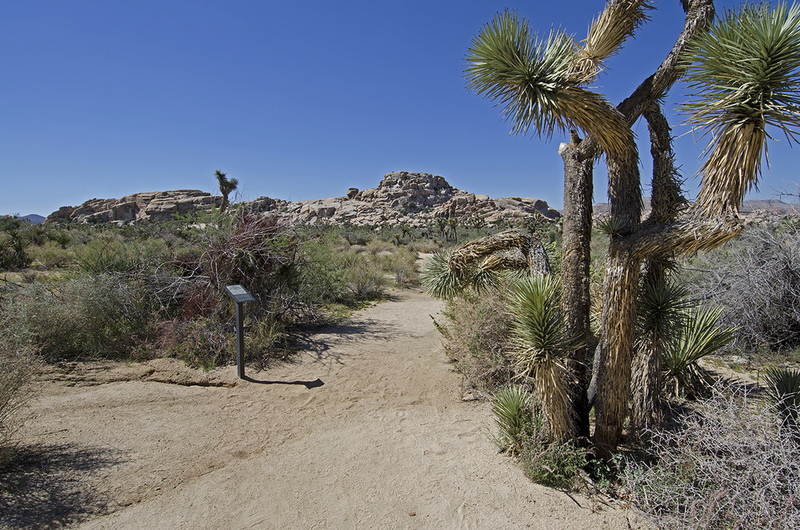 Lots of interesting things to wonder about as you wander along this trail. Dam! 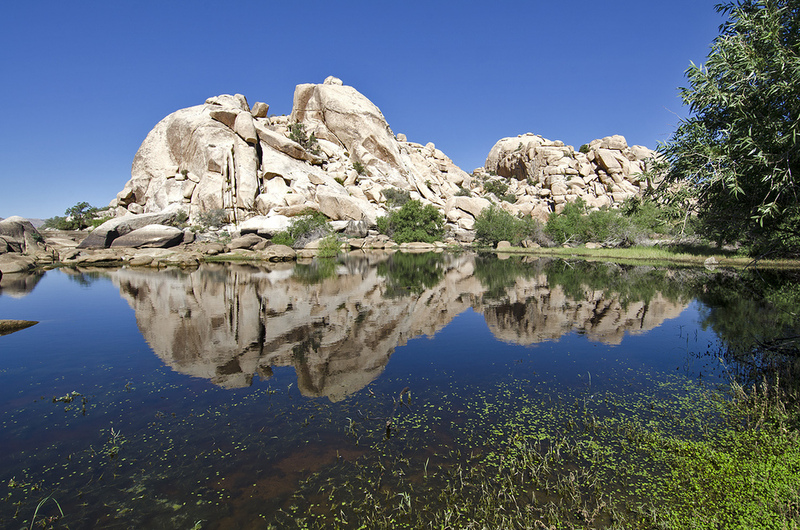 Barker Dam! There it was and there was still a lot of water in it. I spent the next hour or so wandering all around the water, taking pictures from every direction I could. It was amazing. 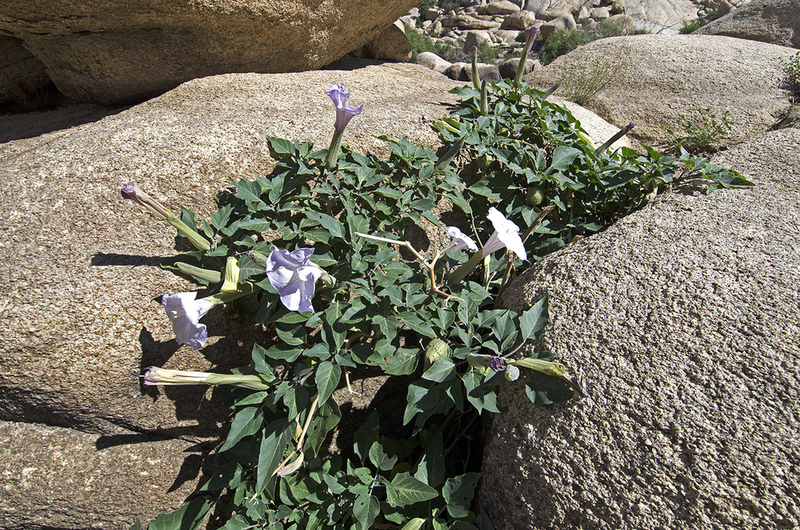 The previous rains and the water in the dam had transformed this normally barren, dry and dust colored area into a green wanderland. 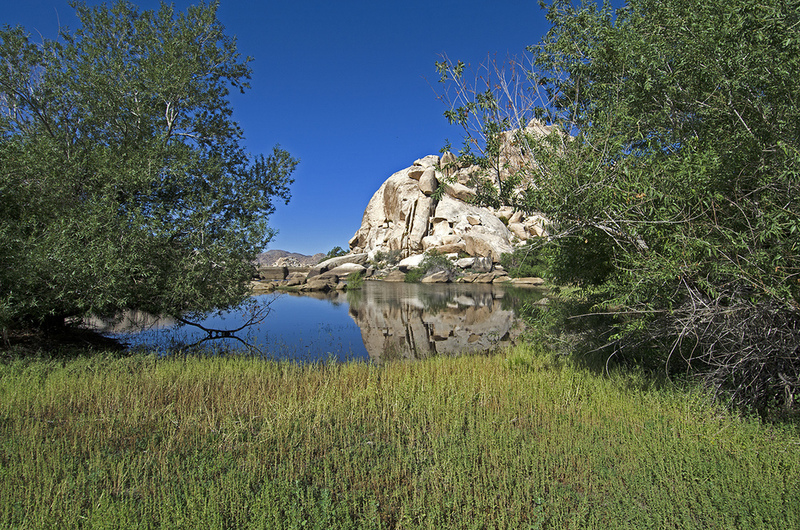 There was grass growing around the lake, the trees all looked refreshed, the cactus and other plants were all rejuvenated and lush. 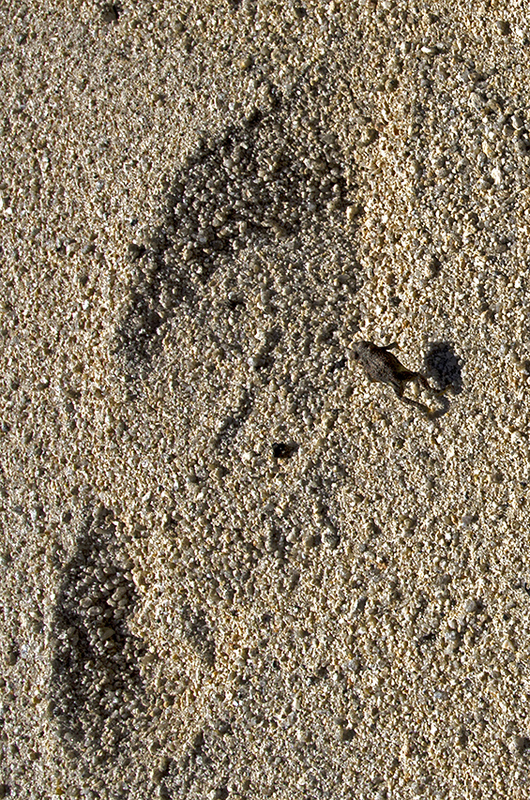 Red-spotted toads were all over the place; they only come out from underground after periods of intense rainfall. I had to watch where I was stepping. After taking a ton of pictures (I love digital cameras), I headed over to the Dam. The area directly around it was closed recently due to vandalism. I guess there will always be idiots in the world; I just wish they would stay home. 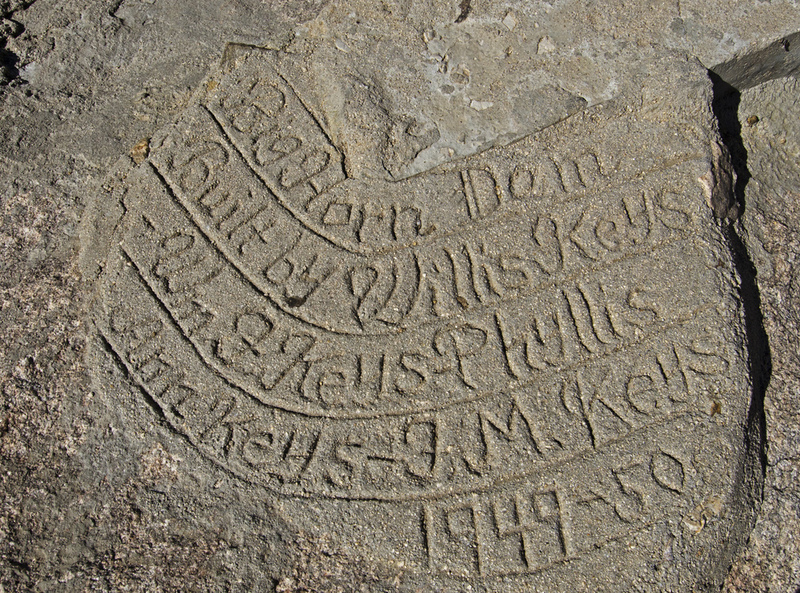 I was still able to get some good photos of the inscription made by Bill Keys on the top of the dam. 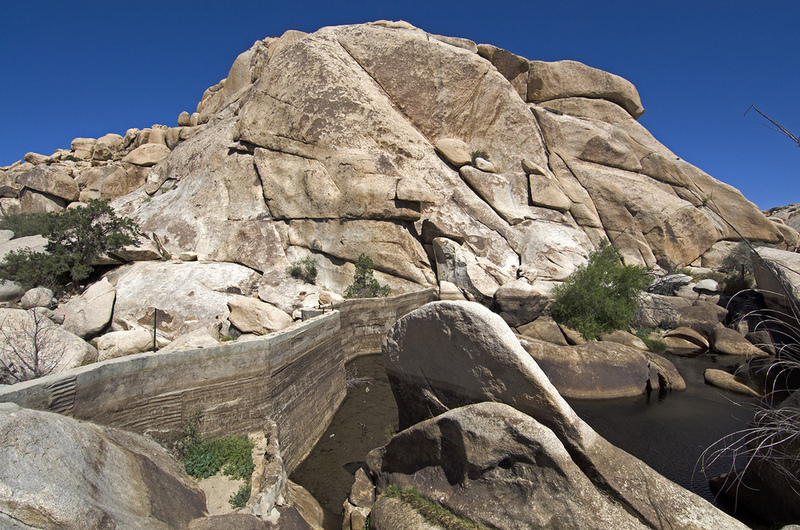 There is a smaller dam below Barker Dam, and just in front of it is a unique stone and cement construction watering trough. 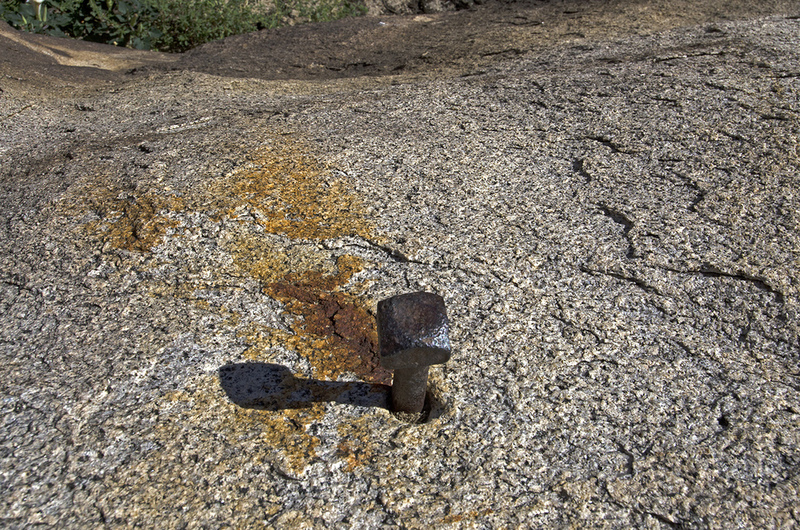 A pipe would bring in water to the trough and quench the thirst of cattle that used to graze here. 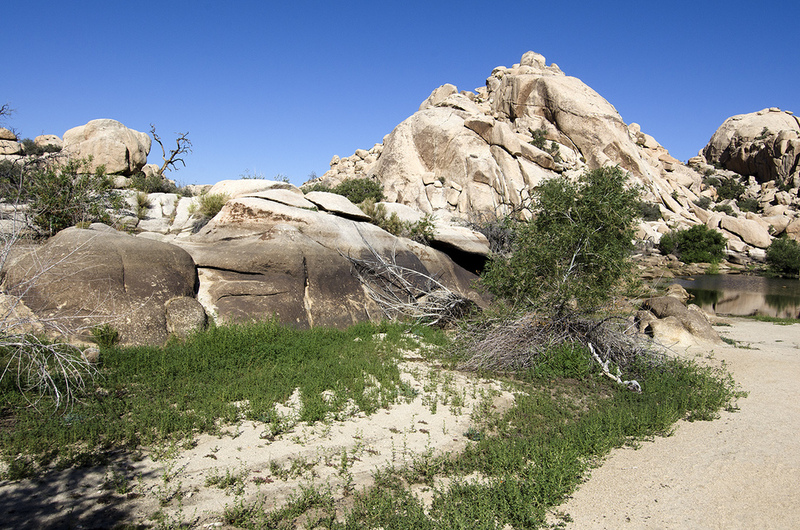 Continuing west along the trail, the narrow confines near Barker Dam quickly widen and spread out into what is called “Piano Valley.” The trail heads somewhat southwest towards a large, flat-topped rock known as “Piano Rock.” Apparently in days of old (1950s), a piano would sometimes be hauled up onto the rock and campers from the Palm Springs area would be treated to a concert. 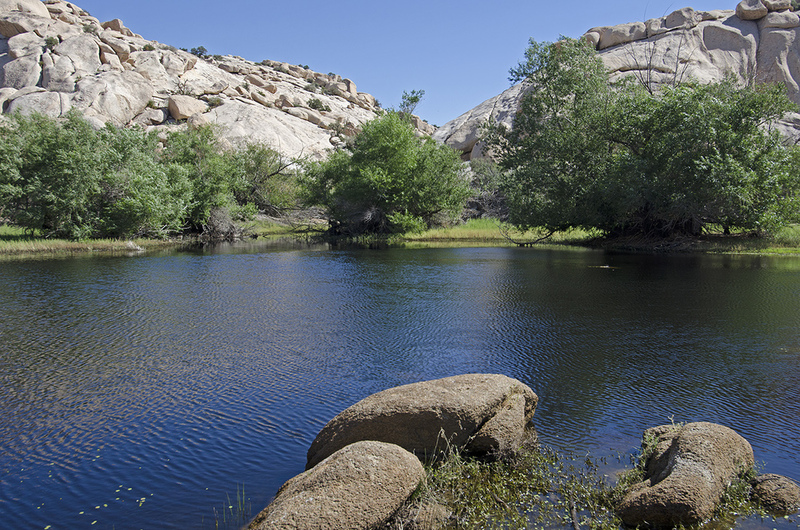 Almost due south of Piano Rock was my next stop along the nature trail. 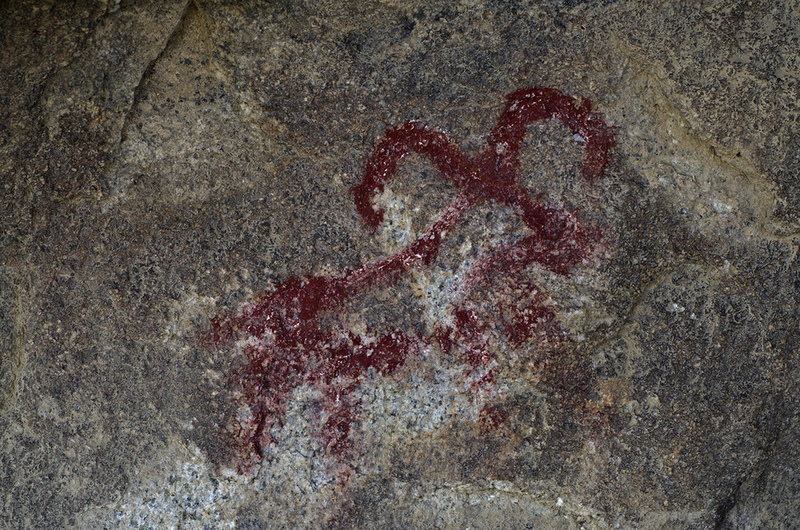 The “Disney Pictographs” (as this location is often referred to as) is undoubtedly the most well-known and oft visited rock art location within the park. 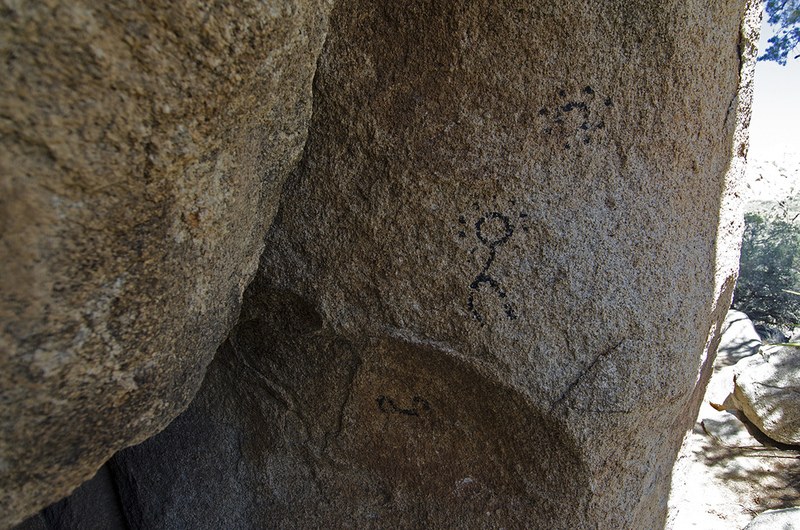 Unfortunately, it is also the least ‘original’ rock art site within the park. 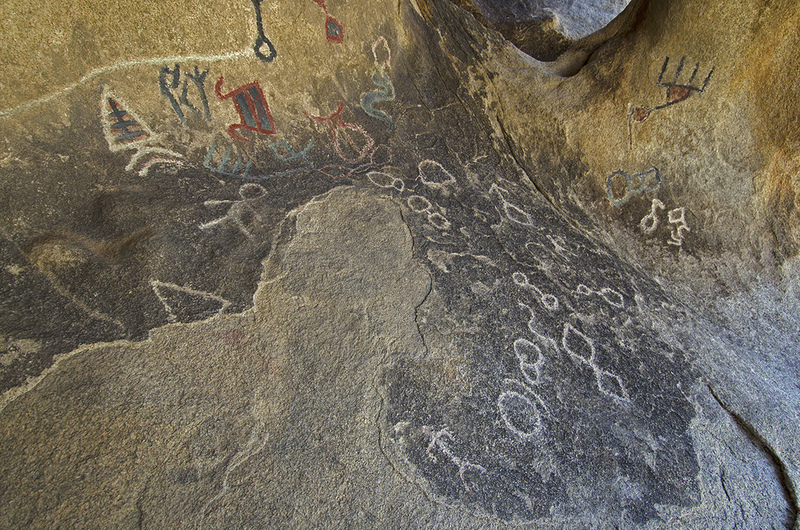 The majority of pictographs and petroglyphs located in the park are the work of the Cahuilla Indians who lived and traveled through this area in season with the harvest times of pinyon nuts, mesquite beans, acorns and cactus fruit. When food was more plentiful elsewhere, they would move on. 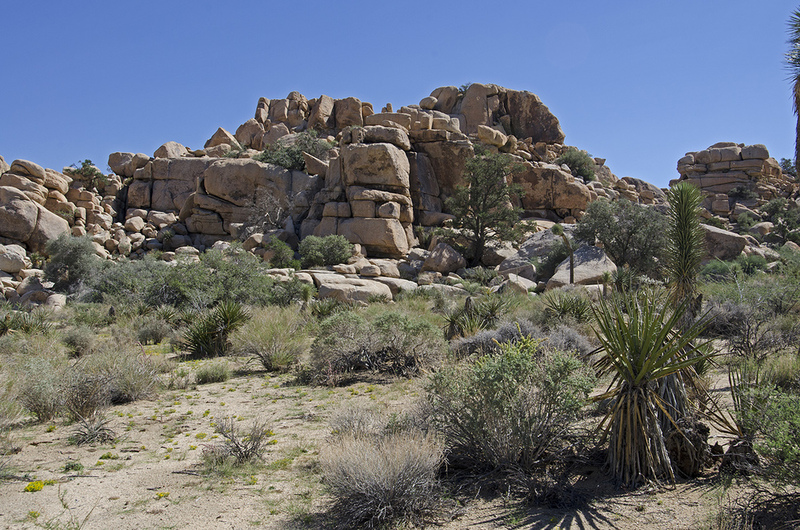 But they left behind rock paintings (pictographs) and rock carvings (petroglyphs), as well as pottery ollas as reminders of their time in the desert. 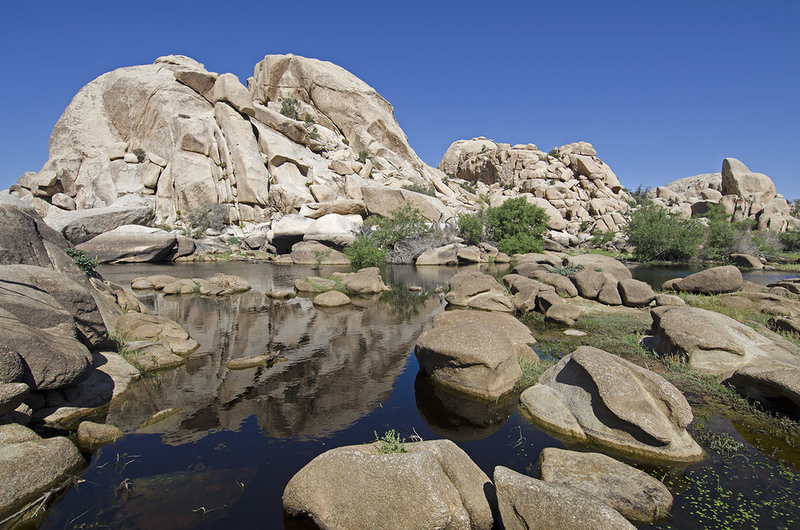 So why does the rock art at this spot along the Barker Dam Nature Trail stand out so vividly? Well, there’s a story behind why I said it’s the least ‘original’ rock art site within the park. Regardless of how it happened, it was an unfortunate event which would be considered vandalism today. 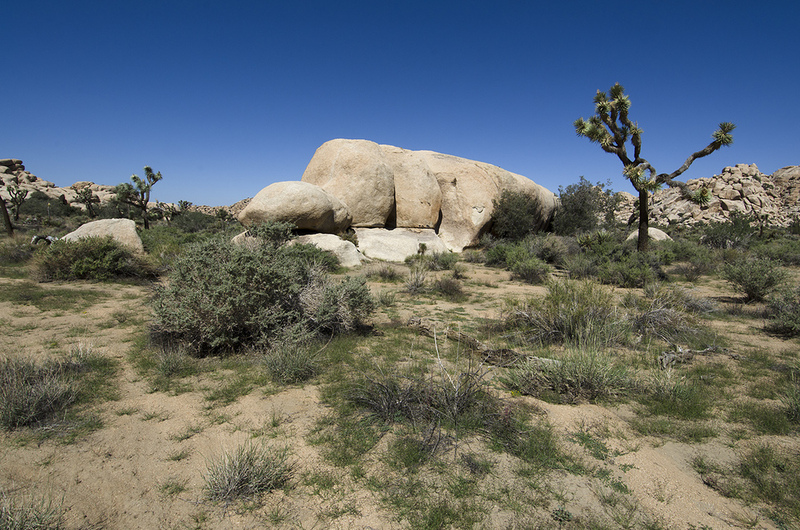 Fortunately, there are other rock art sites within the park that remain in their ‘unenhanced’ condition for visitors to seek out and enjoy, if they know where to look. In fact, on this trip I walked around the rock clump that makes up this site and found what I believe are two original pictographs that escaped the Disney painters. Maybe you can find them, too. Getting back on the trail heading east, instead of staying on the trail I hugged the rock wall as best as the brush would allow. I remembered there being some interesting things to find along the rock walls (hint hint) and wanted to see if I could find them again (yes). The trail was almost done. It wound through a rather narrow rock canyon and soon completed the loop, back at the fork from the beginning of this story. The parking lot was only a few hundred feet away, but instead of returning to my truck, I turned back around and headed into a more remote region in the wonderland, to see what I could find.